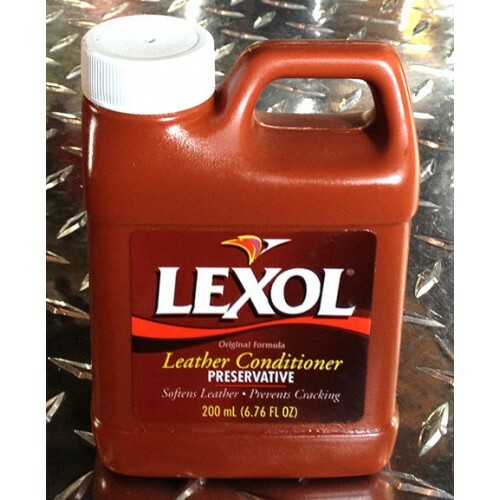 Lexol Conditioner is a liquid conditioner and preservative intended for use in the care and conservation of leather. It works to preserve and maintain the strength, beauty and flexibility of leather -- old and new -- and to help restore resiliency to old or neglected leather that has become hardened and stiff. The modified oils in Lexol Conditioner are retained in the area of application to protect against migration, or seepage, into adjacent materials or surfaces. Directions: 1. 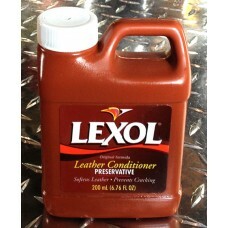 Clean leather first with Lexol Leather Cleaner. 2. Shake well. Test small, inconspicuous area first. 3. Apply a small amount of conditioner to a clean, wet Lexol applicator sponge or cloth. 4. Rub into leather in a gentle massaging motion. Wipe off excess and repeat if necessary. Remember, a little bit of Lexol goes a long way. Multiple light coats are better than one heavy coat.